Lisa Ben, “In Explanation,” Vice Versa 1, June 1947. The politics of naming are particularly resonant within queer communities. Names have the capacity to be violently imposed by others as well as act as a liberatory step towards self-recognition and visibility. Edyth Eyde’s pseudonym acts as a wink to her audience, hiding her true identity while developing a campy alternate persona to engage with her gay readership. Edyth Eyde stopped producing the magazines when her office work changed and she did not have the time or space to type them up. Eyde told Marcus that by that time, she was more interested in living her gay life (under her real name) and not just writing about it. Like most queer projects, naming has also been a central theme in Eric Marcus’ book and subsequent podcast. The first edition of Eric Marcus’ collection of oral histories of gay movement leaders, Making Gay History, was titled Making History. Marcus explained that when he published the book in the 1990s, his editors feared that the book would not be displayed in bookstores with the word “Gay” in the title. Marcus also tried to no avail to have the first or even the second edition marked with the catalog listings of “American History” and not just “Gay Interest”—dictating where the book would be shelved and who would go looking for it. With any project comes omission—what is not addressed, who is not called, where one does not go. By naming a project “Making Gay History” Marcus is adding to the increasingly robust gay archive, helping to construct the overarching historical narratives of what gayness means and where it has been located and expressed. Naming therefore begets definitions. Building “gay history” is part of historiographical movement towards defining what indeed “gay history” includes. For Eric Marcus’ time capsule of interviews completed in the 1980s, this meant “the movement,” or the 20th century gay rights struggle beginning with the Mattachine Society. Therefore, his oral histories center those focused on political reform (and in some cases, revolution). What does it mean to confine “gay history” to “the movement”? As seen in critiques of feminist wave theory, confining research of a historically marginalized group to a self-defined “movement” often creates a narrow scope highlighting largely white cisgender people. By not addressing community-building, resistance through care networks, or the long history of trans and queer people existing before the 1950s, Marcus limits the building of “gay history.” Marcus explains that his subsequent research after his initial interviews in the 1980s exposed him to earlier figures in gay history, like Magnus Hirschfeld. However, looking to queer and trans people of color for early gay history remains missing in the project. Modeled after a map by Jeanne Flash Gray, “Tipin’ Out In the Life,” Lesbian Herstory Archives. Community and social consciousness arose in contexts much earlier than often acknowledged in normative, white cisgender gay narratives. 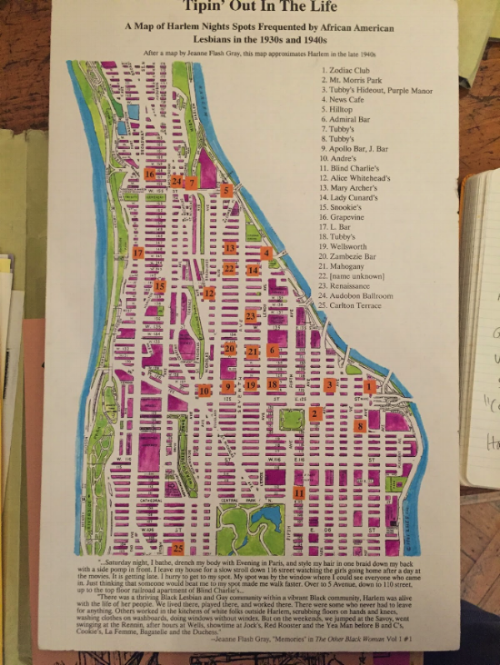 This map of Harlem clubs which acted as community gathering spaces for black lesbians in the 1930s and 40s challenges gay history timelines dominated by white gay men. Naming is not about words. It is about the right to be seen, recognized, and (fully) alive. In order to help build a robust, diverse, and expansive queer and trans historical narratives, historians must use sources outside of traditional materials. To queer the archive is to push against the hegemonic constraints of archival processes, encourage messiness, and ultimately break down what an archive means. Building gay history cannot and should not be approached like straight, normative history-building. To do this, we must make our own archives, interview our community members, and provide for the future queer and trans history building we desire.